If you head south from the A47 east of Norwich, you enter a land of narrow, high-hedged lanes, a rolling landscape that dips to meet the rivers. Apart from the little ferry at Reedham, there is no way of crossing the Yare, and so this area remains isolated. Nobody comes here by accident. As you head eastwards, the landscape flattens, and the aspect becomes bleaker. We really are beyond the back of beyond here. A mile from Halvergate, along a straight, narrow lane, you reach this church and a couple of neighbouring houses - and then that is it, pretty much. Eastwards of here for almost five miles there is nothing but the marshes - no roads, no houses, no people, until you can at last cross the river and meet brash, noisy Great Yarmouth huddled on the coast. 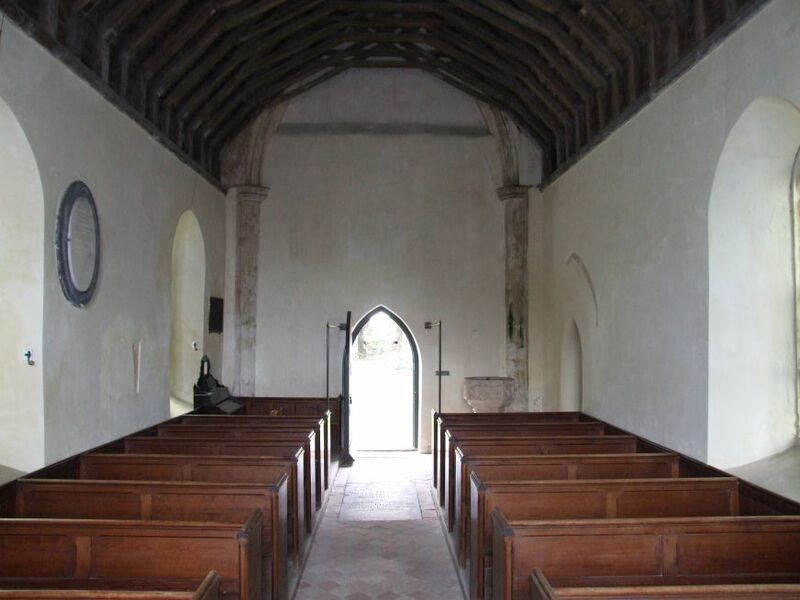 When this church was first here, it serveds a coastal village, poised on the edge of the great estuary. The tower must have been a beacon for shipping. 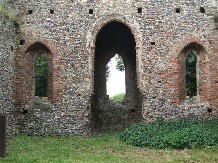 But the estuary was drained for grazing land, and today the tower is broken toothed. 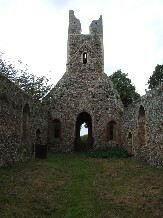 It gazes down on an empty, roofless nave, a shattered remnant of the glory that once was Catholic England. It is easy to see that this church would soon be abandoned once the Protestant Reformation asserted the primacy of congregational worship. It was a big church, and there would never have been enough parishioners to fill it. The parish was subsumed into larger Halvergate, and the building here fell into disuse. 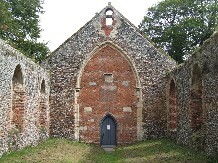 At the start of the 18th century, the chancel was restored by the Jenkinson family, probably for use as a mausoleum chapel. 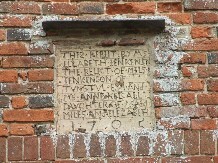 The chancel arch was bricked in, and a new doorway made at its base.Their crude plaque above the entrance records that THIS REBILT By MrS ELZABETH JENKENSN THE RELICT OF MILS JENKENSON OF TUNSTUL ESq ANd MrS ANNE KELCAL DAUGHTER OF ye SAId MILES ANd ELIZABETH 1705. 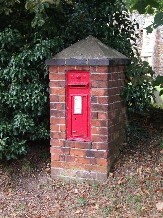 It isn't possible for me to show the letter reversals, but this is evidence, I think, of what a backwater Tunstall was if this inscription was thought appropriate, nearly half as century after the end of the Commonwealth had restored at least a modicum of Education to the English people. 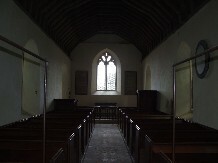 In the 1860s, the chapel was extended eastwards, and a rather pretty window added. 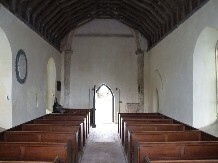 The interior is untouched since then, maintained by local people and a charitable trust. Visitors are welcome. 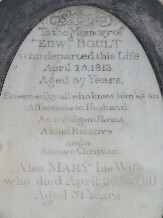 There is a plaque to the memory of Edward Boult on the south wall; a century after the Jenkinson inscription we are told that he was Esteemed by all who knew him as an Affectionate Husband, An indulgent Parent, A kind Relative and a Sincere Christian. And what more could be asked of any of us? 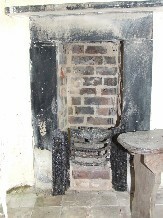 In the vestry, added at the time of the 19th century restoration, there is a pretty fireplace - you can imagine the minister warming himself at it while he waits for Divine Service to begin. 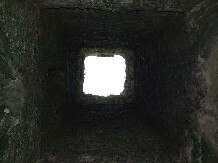 Apart from that, the interior is rather dark and gloomy, with little of historical interest. But of course, that doesn't matter. 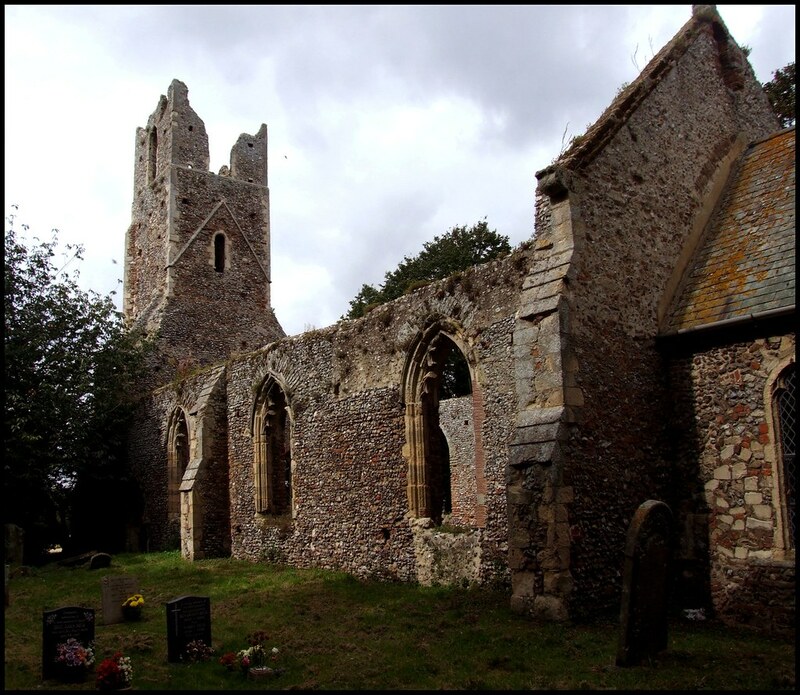 You come here for the atmosphere, a sense of the presence of God out here where the land takes over, the silence, and perhaps, a very rustic feeling of what it might have been like to live in 19th century rural Norfolk.